Joe Dressner gets all of the credit for being the first importer of natural wine. But meanwhile, up in Rockland, Maine, Paul Chartrand Imports had to deal with idiots calling his wines wheat grass, whole wheat and holy crap. You see, he started to bring in organic wine with minimal inputs when the world was wine clueless to its manipulations. I’ve known Paul since the 90s. Well, sort of. I didn’t know any of his history. The fault had been mine. I never thought to ask. What I did know was that those in his wine stable were impressive in a quiet way, much like him. Last year when I, as always, saw him in the Loire for the tasting assaults, he clued me into a cheapish, serviceable hotel near Republique. I booked it (since then, three times in fact), and followed his suggestion that I make sure I snagged one with a private bath. 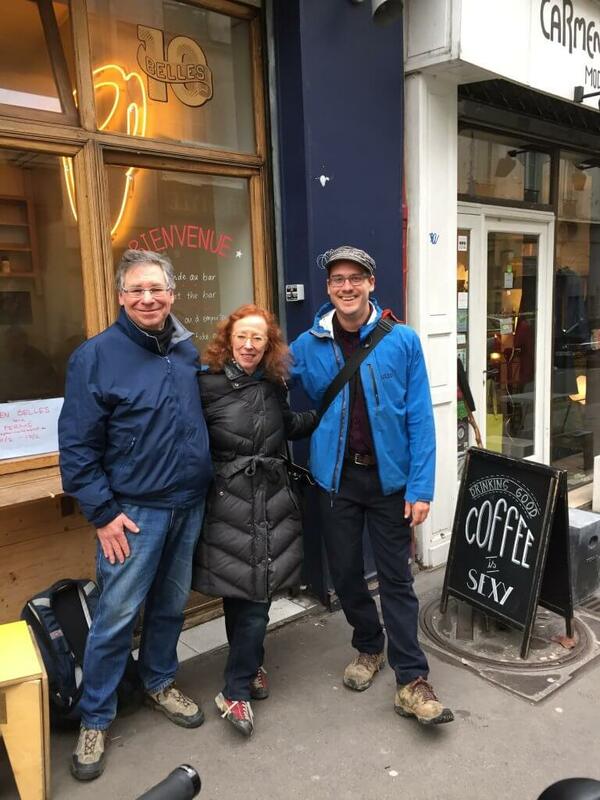 We decided to meet when in Paris for a good coffee with his new employee, Justin DeWalt. I suggested The Ten Belles. For a change, I was getting sick, fever was coming on. Settling back into my morning latte, I finally got to asking Paul about his path to wine. While he and Justin were eating some sort of bacon-y everything bun, the words started to flow. In 1969, after two years of Columbia University student strikes protesting everything else everywhere else, studying chemical engineering, he, a boy from Worcester, moved back to Western Massachusetts. He started eating, selling and “co-oping” natural foods. Then looking to go deeper into the back-to-the-land-lifestyle, he moved to Maine, where until 1982 he worked for the Maine Organic Farmers & Gardeners Assoc. Faust’s Champagne created the prototype for the portfolio; delicious and not flashy. He was one of the earliest organic vignerons in France and certainly in Champagne, where organic was even less popular than the devil. Fueled with naïve enthusiasm, Paul segued out of health food and got his import license in 1985. He had picked up Chateau Bousquette from Saint Chinian as his second wine, returning to France on the hunt of some good whites. He had a book to guide him, not someone like Richard Olney. Dumb luck or just terribly talented? His selections make me go with the latter. Using that Nature & Progres’s book as his friend he ended up with the Muscadet’s first biodynamic producer and one of its best. I rest my case. Paul was the first serious US importer to come out of a conviction for organic viticulture. He precociously understood that wine was food, something that is only catching on today. He feathered his quiver with the worthy. In Burgundy, Guy Chaumont. Loire? He was the one who convinced Guy Bossard, now succeeded by Fred Niger Van Herck. Pascal Lambert. Mark Angeli, for God’s sake! They say the second mouse gets the cheese. Paul had the instinct to take on, such as Claude Rateau and Giboulet in Burgundy and Chateau le Puy in Bordeaux, yet had to let them go—the world in the 90s was not ready for natural (or natural enough) wines on the high end of the spectrum. And with the hipster wine importers today, you might say there’s a bit of second mousing going around the cage. (You know what? When we next meet, maybe this time at Aux Deux Amis, I’ll ask him how he feels about his position in the nibbling order.) But I’ll tell you something about this particular first mouse’s stable of producers; Paul might not have known it but he built his business on humility and sincerity. And a little bit of end-of-year praise is in order. Justin gave me a delicious bar of chocolate and we parted ways. I went to Mokonuts, where I tried to ignore the growing fever and fell into a pile of delicious labne, carrot soup with sumac, downed a doliprane and was almost good to go. Thank you, Alice. Beautiful piece.